in the near future. 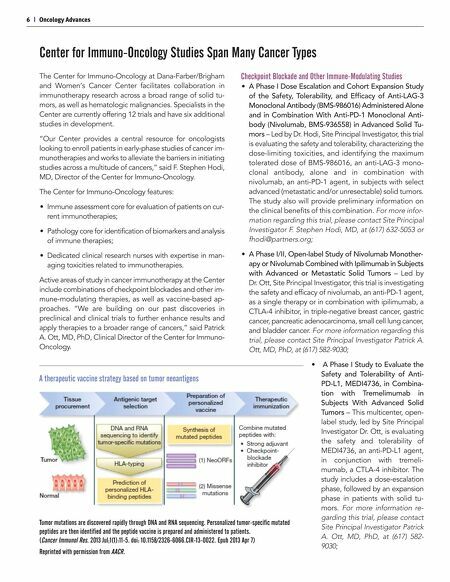 For more information regarding this trial, please contact Principal Investigator Patrick A. Ott, MD, PhD, at (617) 582-9030; • A Phase I Trial of a Dendritic Cell Activating Scaffold In- corporating Autologous Melanoma Cell Lysate in Metastatic Melanoma Patients – Dr. Hodi is collaborating with researcher Glenn Dranoff, MD, Leader of the Cancer Immunology Program at Dana-Farber/Harvard Cancer Center, on a Phase I trial of a dendritic cell activating scaf- fold vaccine (WDVAX) that incorporates autologous melanoma cell lysate in metastatic melanoma patients. The tumor lysate is combined with adjuvants, including the granulocyte macrophage-colony stimulating factor (GM-CSF) protein and cytosine and guanosine (CpGS), which attract and stimulate the immune system's dendritic cells when the vaccine is implanted under the skin of a patient. For more information regarding this trial, please contact Principal Investigator F. Stephen Hodi, MD, at (617) 632-5053 or fhodi@partners.org. Dana-Farber/Brigham and Women's Cancer Center | 7 Patrick A. Ott, MD, PhD Clinical Director, Center for Immuno-Oncology, Dana-Farber/Brigham and Women's Cancer Center F. Stephen Hodi, MD Director, Center for Immuno-Oncology, Dana-Farber/Brigham and Women's Cancer Center T-DM1 Trials Lead to Expanded Options for Patients with HER2-positive Breast Cancer… continued from page 5 Tolaney, MD, MPH, this randomized study is evaluating the side effects and efficacy of T-DM1 compared with paclitaxel and trastuzumab in patients with early-stage HER2-positive breast cancer who are node negative with a tumor no larger than 2cm. These patients are considered at lower risk of breast cancer recurrence. For more information, or to refer a patient for this study, please contact the Breast Oncology Research Line at (617) 632-3478. Combination Therapy for Advanced Breast Cancer Dr. Krop also is the Site Principal Investigator of a current Phase 1b study combining T-DM1 with ONT-380, a HER2- specific kinase inhibitor, in patients with metastatic HER2-pos- itive breast cancer. ONT-380 easily crosses into the brain and is more specific to HER2 than other current options. For more information, or to refer a patient for this study, please contact the Breast Oncology Research Line at (617) 632-3478. "All of these studies support our goal to continue to advance the effectiveness of treatments for our patients while reduc- ing side effects," said Dr. Krop. 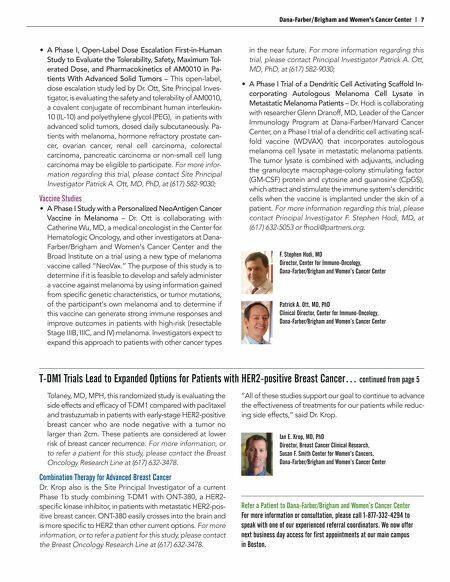 • A Phase I, Open-Label Dose Escalation First-in-Human Study to Evaluate the Tolerability, Safety, Maximum Tol- erated Dose, and Pharmacokinetics of AM0010 in Pa- tients With Advanced Solid Tumors – This open-label, dose escalation study led by Dr. Ott, Site Principal Inves- tigator, is evaluating the safety and tolerability of AM0010, a covalent conjugate of recombinant human interleukin- 10 (IL-10) and polyethylene glycol (PEG), in patients with advanced solid tumors, dosed daily subcutaneously. Pa- tients with melanoma, hormone refractory prostate can- cer, ovarian cancer, renal cell carcinoma, colorectal carcinoma, pancreatic carcinoma or non-small cell lung carcinoma may be eligible to participate. For more infor- mation regarding this trial, please contact Site Principal Investigator Patrick A. Ott, MD, PhD, at (617) 582-9030; Vaccine Studies • A Phase I Study with a Personalized NeoAntigen Cancer Vaccine in Melanoma – Dr. Ott is collaborating with Catherine Wu, MD, a medical oncologist in the Center for Hematologic Oncology, and other investigators at Dana- Farber/Brigham and Women's Cancer Center and the Broad Institute on a trial using a new type of melanoma vaccine called "NeoVax." The purpose of this study is to determine if it is feasible to develop and safely administer a vaccine against melanoma by using information gained from specific genetic characteristics, or tumor mutations, of the participant's own melanoma and to determine if this vaccine can generate strong immune responses and improve outcomes in patients with high-risk (resectable Stage IIIB, IIIC, and IV) melanoma. Investigators expect to expand this approach to patients with other cancer types Ian E. Krop, MD, PhD Director, Breast Cancer Clinical Research, Susan F. Smith Center for Women's Cancers, Dana-Farber/Brigham and Women's Cancer Center Refer a Patient to Dana-Farber/Brigham and Women's Cancer Center For more information or consultation, please call 1-877-332-4294 to speak with one of our experienced referral coordinators. We now offer next business day access for first appointments at our main campus in Boston.